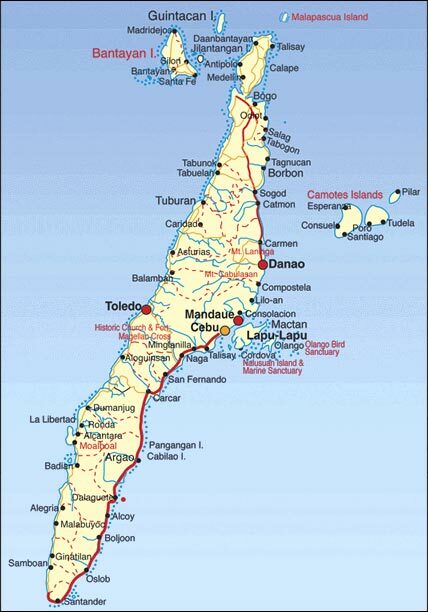 It was in the province of Cebu that Ferdinand Magellan first set foot in Philippine soil back in 1521. Even before the Spaniards came, trade with the Chinese already flourished in the province. Prosperity has continued, and today, Cebu City , known as the Queen City of the South, has become a thriving, highly urbanized center that comes second to Manila 's bustling metropolis. Only a few minutes away from the city are numerous white sand beaches, crystal blue waters, and swaying palms, making Cebu a perfect destination for both business and leisure. Mactan Island is a coral island and famous scuba diving and beach site. It is also the site of the Export Processing Zone. Malapascua Island is endowed with white sand beaches and crystal clear waters, and the west coast is ideal for swimming and snorkeling. The sleepy little market town of Moalboal was one of the first places where scuba diving caught on in the Philippines . From here, you can dive straight off Panagsama Beach , which is home to an extraordinary array of coral, anemones, sponges, and a swarming host of brightly colored reef fish. lango Island in Cebu supports the largest concentration of migratory birds found in the country. These birds migrating from Russia stop here en route to Australia. ( Magellanes St .). Planted in April 21, 1521 by Ferdinand Magellan; spot where the first Christian Filipinos, Rajah Humabon and Queen Juana and about 400 followers, were baptized by Fr. Pedro Valderema. In 1525 to 1740, the Agustinian priests built an open shrine for the cross but the natives began to take chips from the cross believing it had miraculous power so a kiosk-like structure was built to protect the cross from total destruction. To protect it further, a hallow cross of tinadalo wood was made to encase the original cross which still stands today. (Pier Area, Cebu City ). The smallest, oldest tri-bastion fort in the country. This served as the nucleus of the Spanish settlement in the Philippines . It has a total inside area of 2,025 sq. meters. The walls are 20 feet high, 8 feet thick, and the tower is 30 feet high from the ground. Work was first started on May 8, 1565 with Miguel Lopez De Legazpi breaking the ground. After the battle of Manila Bay , Commodore George Dewey turned the fort to the local Cebuanos, and then it became the American Warwick Barracks during the American Regime, which was later converted into classrooms where the Cebuanos received formal education. During World War II, from 1941 to 1945, it served as fortification for Japanese soldiers. When the battle for liberation was fought, the fort served as an army camp. After 1950, Cebu Garden Club took over and fixed the inner court into a miniature garden. For a couple of years it also housed the Cebu City Zoo. In 1978 to August 15, 1993 , it housed the offices of Department of Tourism and the Philippine Tourism Authority. At present, it is under the care and administration of the PTA and now houses the National Museum that showcases the San Diego shipwreck & Fort San Pedro diggings. ( Colon St. , Cebu City ). Located in the original Plaza Parain, it showcases the significant and symbolic events in the history of Cebu from the time of Rajah Humabon to the recent beatification of Cebuano martyr Pedro Calunsod. The monumental sculptural tableau is the work of national artist Edgardo Castrillo. Construction began on July 1997 and it was inaugurated on Dec. 8, 2000 . (Punta Engaño, Lapulapu City ). Inspired by his success in Christianizing the people of Cebu , Magellan crossed the channel to Mactan Island in an effort to spread the faith. Before he reached the shore, he was killed by island chieftain Lapulapu and his men during the battle for supremacy and freedom on April 27, 1521 . Efforts to retrieve the body of Magellan were futile inspite of the offer to trade jewelries and spices for the dead body. This marker was erected in 1866 to mark the spot where the great explorer died. The oldest street in the Philippines was built by the Spaniards in the time of Miguel Lopez de Legazpi. Named after Christopher Columbus, it is the heart of downtown Cebu , a glittering area by night lined with moviehouses, restaurants, department stores, and other business establishments. An obelisk detailing its historical significance was constructed on its northern end. ( Osmeña Blvd. , Cebu City ). The seat of the Provincial government, is of pre-war vintage, and has the undulating mountains of Cebu for its background. Majestic and imposing, its high dome can be seen along Osmeña Boulevard . A replica of the United States ' White House. One of the many beautiful capitol buildings in the country, constructed in 1937 under the administration of Governor Sotero Cabahug. (across Mandaue City ). A coral island and famous scuba diving site, where beach resorts of international standards are located. Also the site of the Export Processing Zone, with 102 companies in operation, employing 37,118 people. Land area – 150 ha. (north of Cebu , across Danao City ). The island is composed of 4 towns: Poro, San Francisco , Tudela, and Pilar. To cross the island, one has to go to Danao City , an hour away from Cebu City , or take a fastferry. There are two boats which travel to and from the island and Danao City everyday. One fastcraft travels from Cebu City. (Matutinao, Badian). One can feel the surrounding lush greenery of the panoramic waterfalls. Olango Island supports the largest concentration of migratory birds found so far in the country. Migration starts from the birds' breeding places of in Siberia , Northern China , and Japan . Based in data gathering so far, the birds use Olango as a major refueling station as well as a wintering ground. At Olango, the birds can replenish their fat reverses by feeding on rich supplies of invertebrates in the intertidal mudflats. These fat reserves must fuel the birds on the next lap of their journey which may cover from 3,000 to 15,000 km. of nonstop flight. 89 km. southwest of Cebu City . Offers white sandy beaches and rich marine life for scuba diving. Notable as an excellent diving area is the water around Pescador Island. (across Mandaue City ). Famous for its beach resorts of international standards and excellent diving, its proximity to Cebu makes it a prime destination for local and foreign travelers. It is also the site of the Export Processing Zone, with over 100 companies in operation, employing close to 40,000 people.